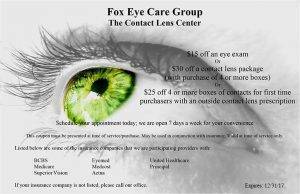 Fox Eye Care Group is a sublease practice, located next to Lenscrafters, with 6 locations in North Carolina. We have two locations at Crabtree Valley Mall and Triangle Town Center. The two locations in Greensboro are at Four Seasons Town Center and Friendly Shopping Center. Our Winston Salem eye care location is in Hanes Mall. We have been serving the eye care needs of our communities since 1991. We offer convenient hours and are open 7 days a week to meet your eye care requirements. We are proud sponsors and participants of OneSight, a non-profit family of charitable vision care programs dedicated to improving vision through outreach, research, and education. All our doctors volunteer in local and regional outreaches to give the gift of sight through OneSight, the local Lions Club, and the local Rescue Missions. Every year we participate in Hometown Day, a day dedicated to providing free vision exams and glasses to the needy children of our area. We also participate with the Vision Van Clinics, a van that travels around the United States providing free eye exams and glasses to the needy. Dr. Fox has traveled on missions to Thailand, Bolivia, Malaysia, Ecuador, Dominican Republic, Africa, and made numerous trips to Mexico to perform free eye exams and provide free glasses to disadvantaged people in those countries.